You'd think it was a self-portrait it's such a perfect match! The happy little Chia seeds grow in to a perfectly coifed Bob Ross style perm. 8"H. Kit includes everything you need to grow. BOB ROSS CHIA HEAD - Bob Ross's hair was almost just as iconic as his calm demeanor and incredible paintings. GROW HIS HAIR - Simply spread the moistened chia seed over Bob's hair, and watch the green sprouts grow. 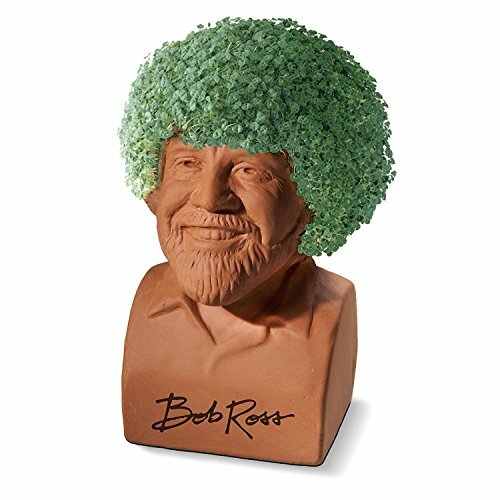 HAPPY LITTLE SPROUTS - Bust sculpture features Bob Ross's signature across the base. CONVERSATION STARTER - Everyone loves Bob Ross, so he's sure to be an eye-catching piece no matter where you place him. GREAT GIFT IDEA - Perfect for any Bob Ross fans or aspiring artistic gardeners. If you have any questions about this product by JOSEPH ENTERPRISES INC., contact us by completing and submitting the form below. If you are looking for a specif part number, please include it with your message.